As your primary mode of transportation, you rely on your car to get to work, the store and the kids’ many events around town. While it’s impossible to prevent your car from ever needing a single repair, you can avoid untimely breakdowns by following these expert tips from Scott’s Fort Collins Auto & Repair. Oil is the most important fluid level to check. Having the right amount of oil ensures proper engine lubrication to minimize friction. Make it a habit to check the oil level every time you fill up the gas tank. If you need to top it off, make sure you use the type of oil recommended by the vehicle manufacturer for the best results. You should also check the coolant level regularly, especially in the summer and while on road trips. This keeps your engine from overheating. If you find the coolant is low, add a 50/50 mixture of coolant and water to the radiator. If your engine regularly overheats, you could have a coolant line leak that needs to be repaired. It’s not enough to just keep topping off the oil level as the engine burns through it. You need to have the oil changed to prevent it from thickening into a sludge that could damage the engine. The old standard is to have your oil replaced every 3,000 miles or every three months, but special performance oils can sustain the proper viscosity for 15,000 miles or even longer. It all depends on the type of oil you use, how much you drive, and weather and road conditions. We can help you determine the proper timeframe for your circumstances. We can also check all other fluid levels when you bring your car in for an oil change. They only account for a very small portion of the engine, but belts and hoses carry the brunt of the vehicle’s function. For example, belts kick start the water pump and get the alternator running, and hoses carry fluids from one part of the engine to another. A snapped belt or leaky hose can mean disaster. Every time you have the oil changed, ask the mechanic to check for cracked hoses and fraying belts so you can have them replaced. Two essential air filters – the cabin filter and the engine filter – work hard to keep air running through the passenger cab and the engine. Dirty filters prevent your car from breathing, which can lead to a breakdown. Check your owner’s manual to see how often you need to replace these filters. 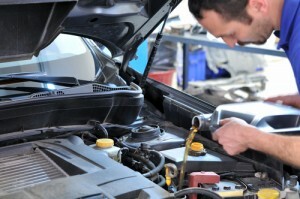 It’s easy for a mechanic to check their condition when you bring your car in for an oil change. You have three main things to worry about when it comes to your tires: rotation, alignment and pressure. Most manufacturers recommend rotating the tires every 7,000 miles. This extends the life of your tires and provides more even wear for a better grip on the road. A good rule of thumb is to have your tires rotated with every other oil change. When wheel alignment gets off, your suspension system suffers. If you find yourself fighting with the car for control, have your alignment system evaluated to prevent worse problems from developing. Proper tire pressure increases fuel economy and helps prevent a blowout on the highway, which can be dangerous, stressful and expensive if you need a tow. Follow the recommended tire pressure in the owner’s manual. Check the tire pressure every time you get gas and top off or reduce the pressure as needed. It’s fun to push your car to its limit, but if you constantly gun it and slam on the brakes, you could wear out the engine and brakes sooner, increasing the need for repairs. Try to accelerate and brake smoothly, avoid tailgating, and stick to the speed limit. These habits not only extend your vehicle’s life, but they keep you safer and improve your gas mileage as well. We can tackle many of these tasks when you bring your car in to Scott’s Fort Collins Auto & Repair for an oil change. Just stop on by or schedule an appointment at your soonest convenience.